Tribes Overall: "Fantastic well rounded and unforgettable experience. We loved it! " Tribes Service: "Rory was our fabulous consultant who really listened to me and helped me tirelessly through the whole process. We were travelling in Costa Rica for a month and had lots of requirements and logistics to work through and he was so patient and helpful and really made our trip! Thank you so much. " Guides: "All tours were of the highest standard and the guides were excellent. Both friendly, fun and incredibly knowledgeable in their field. I would highly recommend them." Social & Environmental Responsibility: "I felt the hotels and tours that were arranged by Tribes were vetted and were obviously socially responsible. " A nice hotel but not much to do here and slightly stuck in the middle of nowhere. However staff are super nice and the local dishes on the menu are delicious. Would recommend for one night as a stopover. Elegant yet charming hotel with a fantastic restaurant and beautiful surroundings. Lots to do here and would highly recommend a visit to the hotel's farm to learn more about their environmental and ecological efforts. A great laugh too as the animals are such characters! Unique and beautiful hotel in the hills above San Jose. Skip San Jose and stay here for sure, it's the best place in the area and full of charm. Beautiful hotel in a wonderfully relaxed seaside town, would highly recommend. Amazing, amazing, amazing. This place is super special. The view, food, the room, the wildlife, the staff, the activities, the pool - I could go on. Just go, you won't regret it! 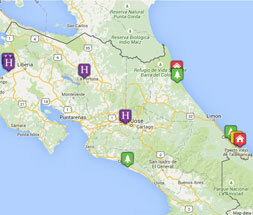 "Costa Rica is an incredible place to visit and we enjoyed so many elements of it that it's hard to pick just a few! Belmar and Lapa Rios were my favourite places to stay but we enjoyed everything really. Travelling around so much showed us the diversity of the country and having Tribes helping us and as point of contact if we needed it really helped and made it totally stress free and great fun. Thank you."